I know that earlier this week we talked about the transition between summer and fall style, and I'm sure some of you were thinking to yourself, "Woah woah woah, girl... summer's not over yet!" and you would be correct. Summer is most definitely not over yet, and there's lots of summer fun to be had and summer dressing to be done! So I'm going to reel it back in a little bit today and try to fight my urge to leave these triple digit Phoenix temps in the dust and jump right into fall (I am, however, jumping in the pic below... see what I did there? ), and focus on finishing strong on the style front this summer! Today, though, I'm focusing on another summer trend, or rather a 2017 trend in general, and that is the art of the polished, casual outfit. No, I'm not trying to trick you with that slightly confusing description. Hear me out. I absolutely love dressing up for special occasions and even occasions that I just feel like they could use some spiffing up, but I'd like to think that one of the hallmarks of my personal style is finding a way to always mix a casual element into every outfit. I enjoy a good dress, and I especially love pairing a dress with a flat sandal when I feel like it can fly. But I have to be honest and say that I enjoy pants more. 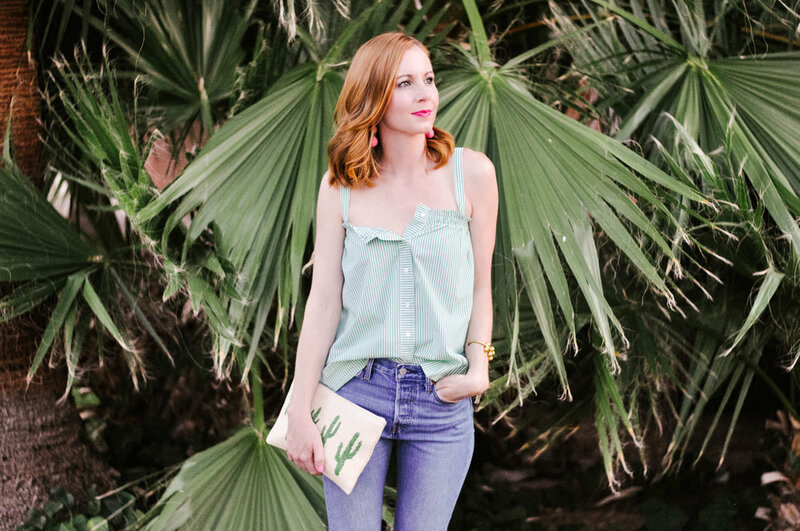 And pairing pants with a structured, feminine or more fanciful top is one of my very favorite things to do because it's a little bit unexpected and allows me to go pretty much anywhere and be dressed appropriately. Or at least that's what I tell myself. If you disagree, just don't tell me. Don't kill my dreams! One blogger that I (and everyone else on the planet) simply adore is Julie Sariñana from Sincerely, Jules, and this girl has absolutely mastered the art of polished-casual style; of finding a way to perfectly mix casual elements into any outfit and marry feminine, even sometimes fancy tops and accessories with destructed denim and a pair of comfy kicks. I'd been eyeing this button down, clover and white striped tank (which also comes in blue & this fun rainbow gingham) from J.Crew, but hadn't pulled the trigger on purchasing yet. Then one night, I happened to walk into the store about ten minutes before they closed and the staff was in the midst of putting all of the sale items that were going on sale the next day out on the sale rack. So not only could I score it in my size, but they were doing a 50% off of the sale price sale that night, so basically it was free. I kid, I kid. But seriously, it was in the $20 to $25 range if I'm not mistaken and BOOM... it still is right now! I love that I can either button it all the way up, or dress it down a little bit and leave the top button undone like I did here. Chris doesn't approve of the "Michigan half-tuck" as he calls it, but I try to enlighten my lovely hubs and tell him that the half-tuck is in no way a product of my Midwestern roots, and is, in fact, a widely accepted staple of lady style. Rude, Chris. Just rude! I've worn these awesome hot pink suede slide sandals from Ann Taylor (that are also currently on major sale) a couple of times now on the blog Here and Here, and I still can't get over how comfortable and fun they are. They may not look like it, but they're definitely a wear-all-day kind of summer sandal, which is always the goal, isn't it? Easy summer livin'. 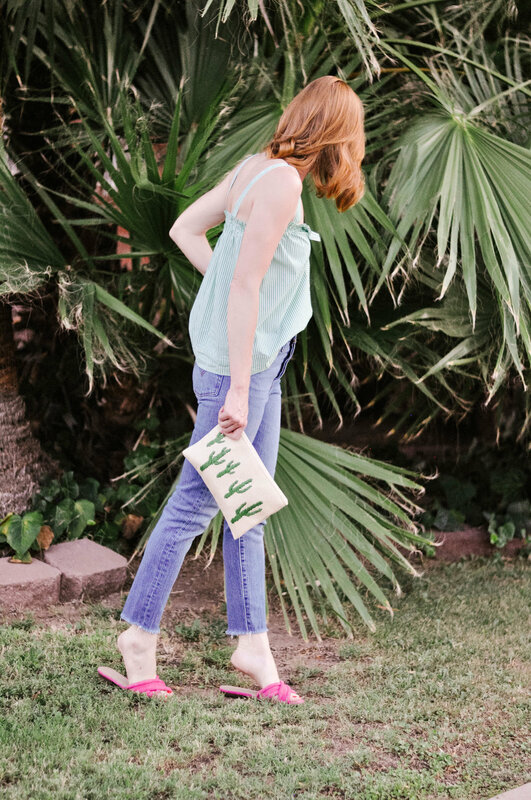 And I've talked about the Levi's Wedgie Icon Jean that I have on here about a million times, but check out Tuesday's post to read about the new denim style that I'm absolutely in love with and where you can score said "golden" pair of jeans on major sale right now! Polished, yet casual. See... not so confusing after all, right? I want to know: what has been your favorite spring/summer trend or trends this year? Did you try and of the trends or steer clear completely? Tell me which trends you loved and loathed in the comments section below, and if you're more into a casual style vibe or like to stay fancy!